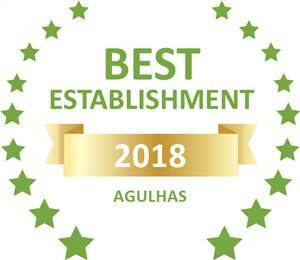 Based on reviews of establishments, Agulhas Ocean House has been voted Best Establishment in Agulhas for 2018. Breakfast is served in the dining room between 8 and 10 am. Fresh fruits, croissants and freshly prepared eggs are on the daily menu. Special dietary requests are accommodated with prior notice. An airy communal lounge with both sea and mountain panoramas has a cozy fireplace for winter nights. The secluded, indigenous garden attracts flocks of birds: this is a place where there is time to watch the birds, smell the fynbos, fall asleep to the surge of the waves and feel at peace. Our rates start at R950/room, breakfast included. Unfortunately we cannot accommodate children.